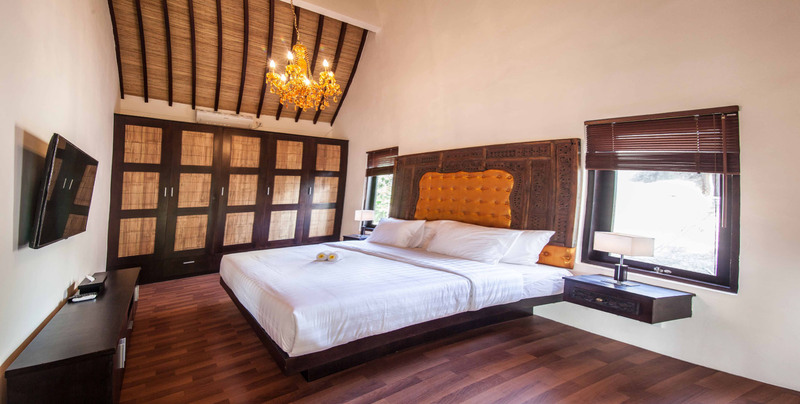 Villa Dayah is an absolutely stunning large newly built interior-designed villa overlooking a private Balinese temple on a private estate. 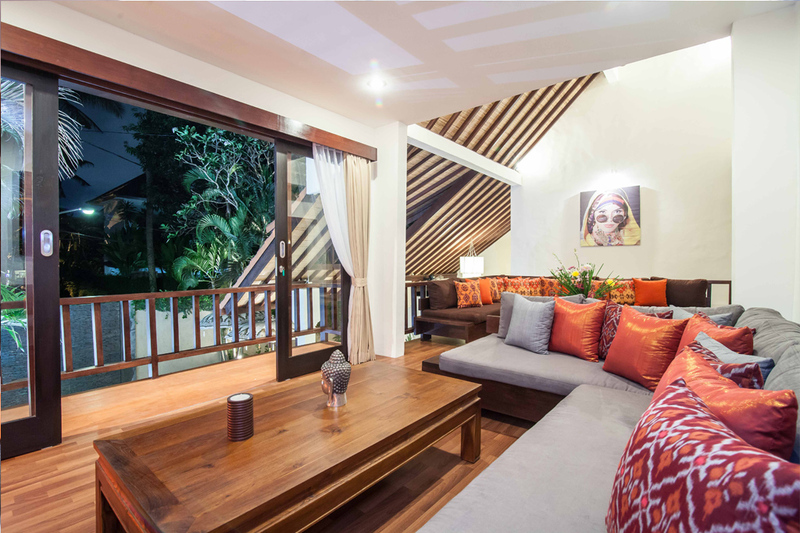 Set in the heart of Seminyak, in a quiet safe leafy estate of only 10 private villas - and yet only a 1 minute walk to the shopping, restaurants, bars and entertainment of Seminyak, and only a 5 minute walk to Bintang Supermarket. The Golden Angel is a dedicated private restaurant connected by internal phone to your villa. Breakfast, lunch, dinner, coffee and tea, soft drinks and party catering can be ordered by internal phone at extra cost. In addition to the private villa swimming pool, there is a separate communal estate swimming pool overlooked by the Golden Angel restaurant which is ideal for supervising the children while you take your lunch or a drink or read a book or have a siesta. Added peace of mind and comfort of an estate staff of 26 including day and night security guards, gardeners and maintenance men. 1 maid full service 6 days per week is included. 2 master double bedrooms, 1 single bedroom. Sleeps 5 to 7 people. 3 bathrooms (2 ensuite). 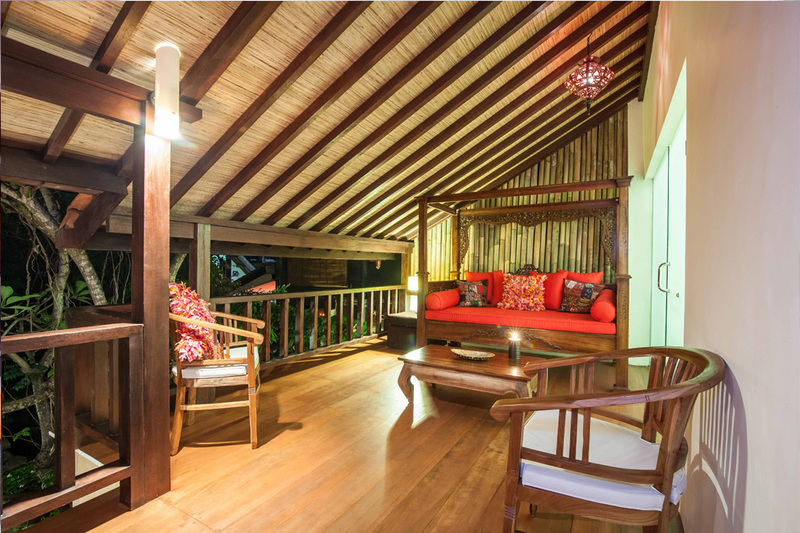 Large first floor verandah with opium bed overlooks your own private Balinese temple. Open plan gourmet lovers kitchen. 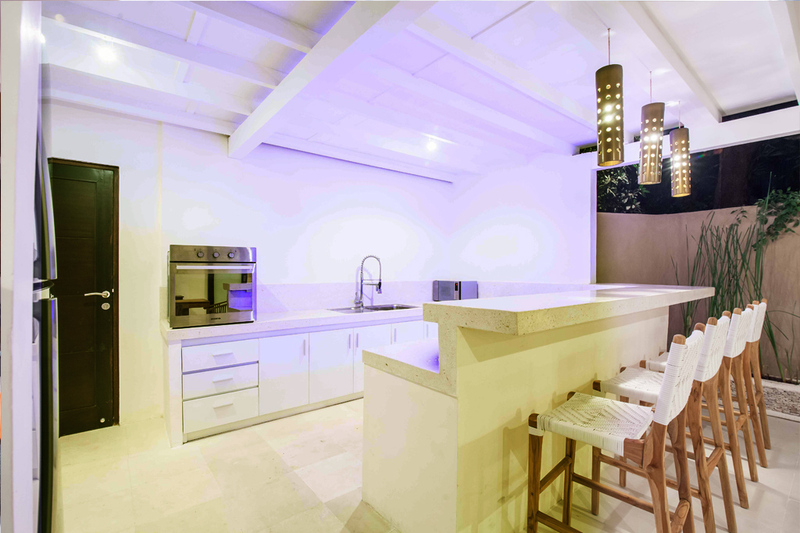 Fully equipped with 4 bar chair breakfast counter, fridge, 5 hob cooker, microwave, eye level oven, drinking water dispenser. Master bedroom 2 with wardrobe, TV and video. 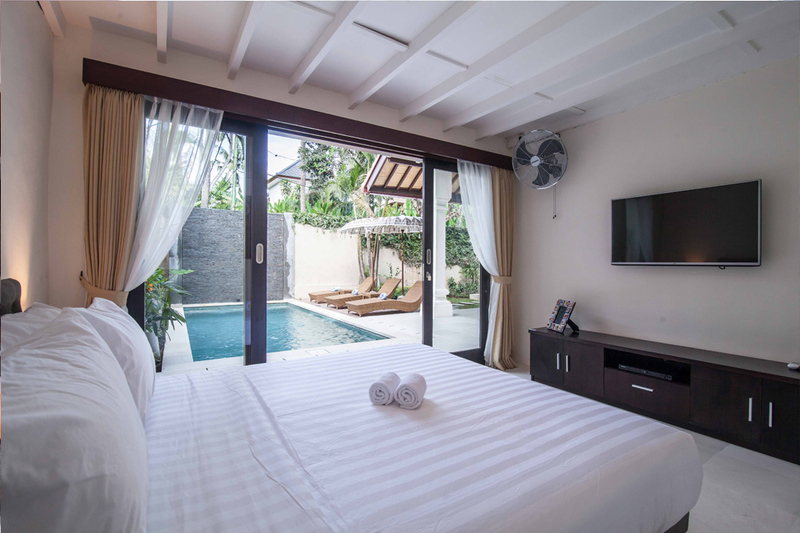 Direct access to the swimming pool and garden. 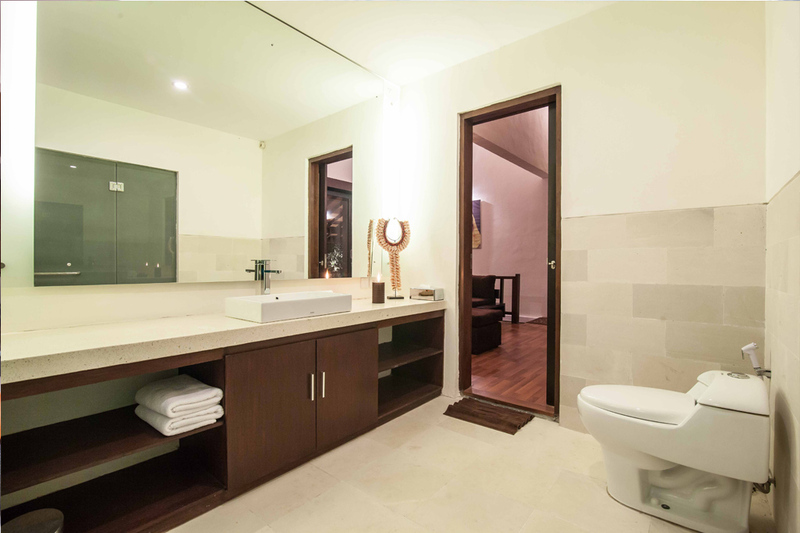 Ensuite bathroom with WC, double wash hand basin, and sunken terrazzo bath built for two! Shower head over bath. (accessed also from the living area serving as a guest WC). Twin bedroom. 2 single beds, wardrobe, TV and DVD, fan, air con. 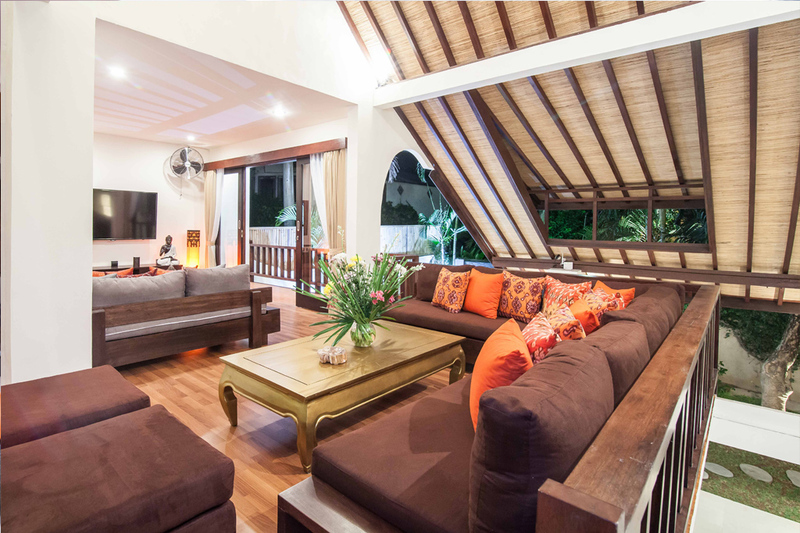 Garden Living room with comfortable L shaped sofa overlooking pool with fan, coffee table and built in corner table. Un-overlooked private villa Garden. 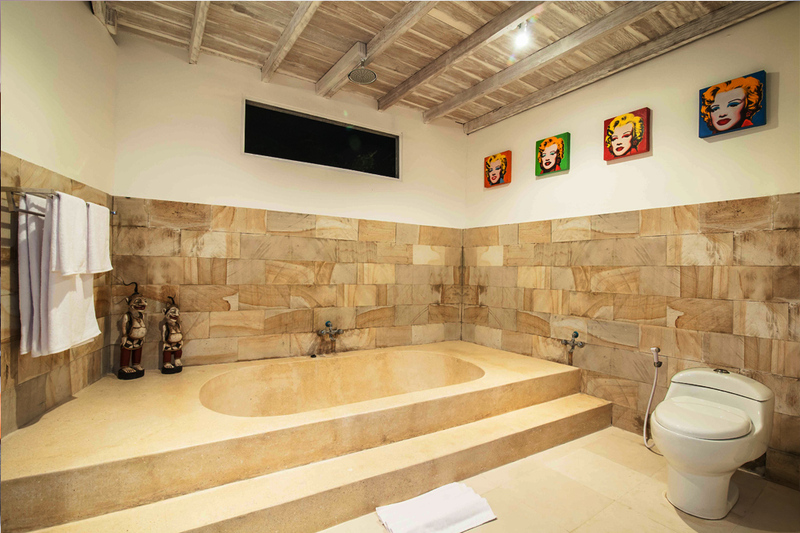 Swimming pool with beautiful stone Buddha feature, cascading water wall. 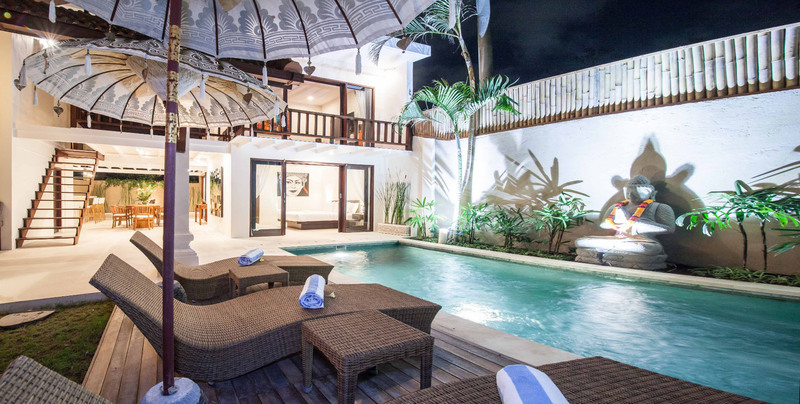 Pool beds and Balinese sun umbrellas. Manicured flood lit flower beds. Private off road parking for 2 cars and many motorbike space . Living room with high ceilings. 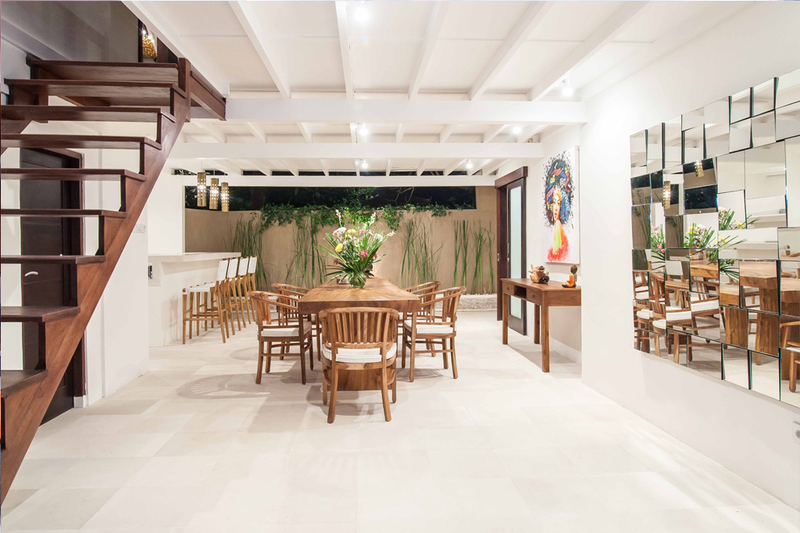 Double doors leading to huge verandah. 2 ceiling fans. Separate bathroom wash hand basin and WC. Wall fan. Direct access to huge verandah. Full surround sound system. Satellite TV and DVD. 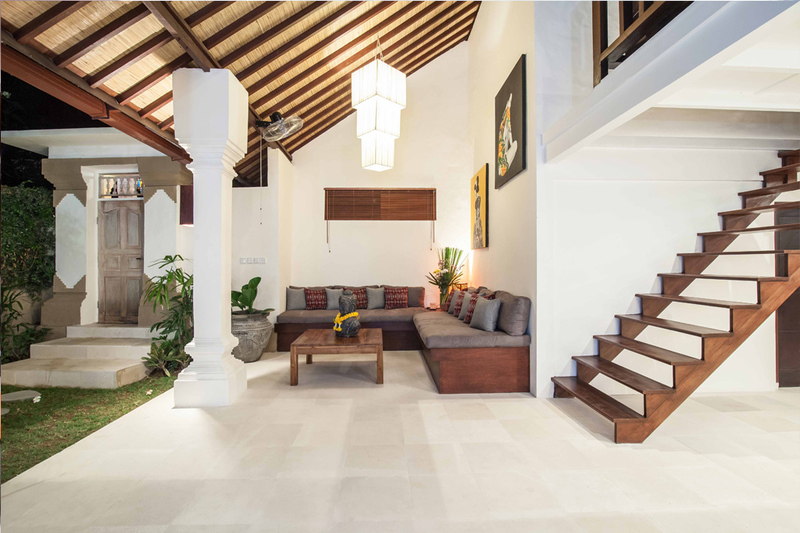 Direct access to small verandah overlooking the swimming pool and garden below. Wall fan. 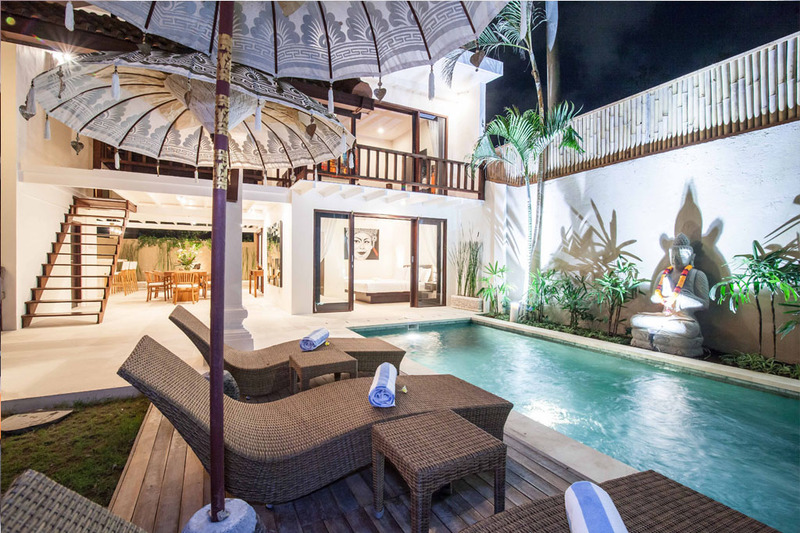 Huge verandah with opulent opium bed overlooking your private Balinese temple and own rear garden. 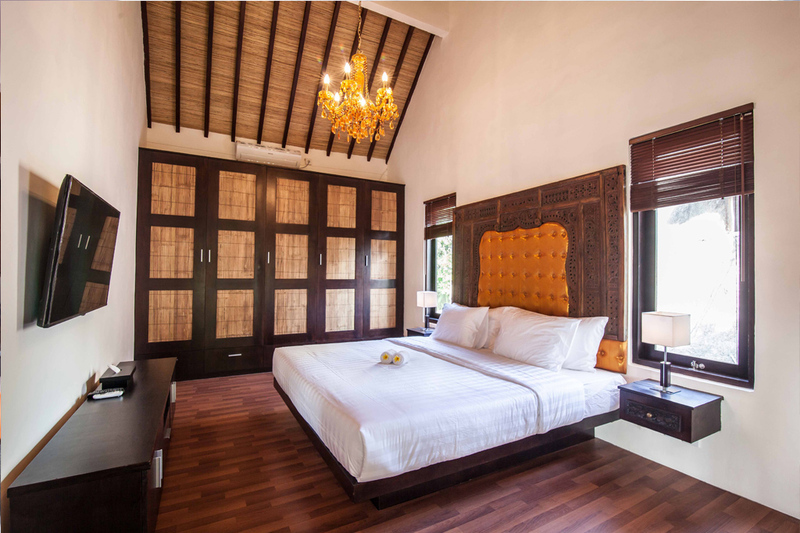 Master Bedroom 1 with full range of wardrobes, air con, fan, direct access to huge verandah (as above). Ensuite shower and WC and wash handbasin. Car rental, chauffeur driven car, baby sitters, motor bike hire, full party catering service (including chefs), sightseeing tours, surfing school, laundry service, airport transfer, traditional Balinese fire dancers can all be arranged by giving ample previous notice, and at extra cost.